Over the holidays, I learned that one oven cannot do everything, including reheating multiple meals for the family. Luckily, I had the Calphalon Quartz Heat Countertop Oven. 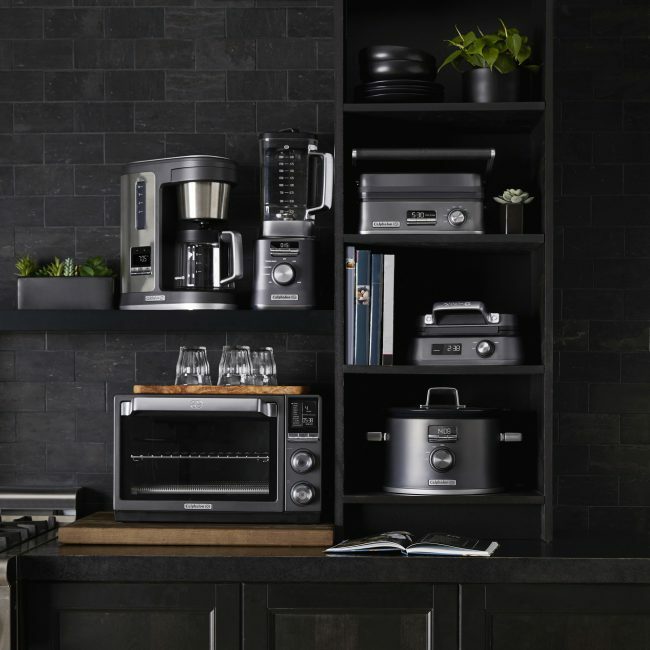 The look is stainless steel with a built-in interior light that allows you to check how far along your food is cooking without physically opening up the oven itself. 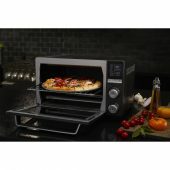 The sheer versatility of cooking, reheating and baking foods without firing up my full-sized kitchen oven along is enough to like about it, but there’s plenty of reasons to enjoy a countertop oven. For example, if you have children who enjoy baking, a countertop oven might allow a parent more wiggle room to trust their children to cook. They preheat very quickly, without wasting needless energy and warming your home up. 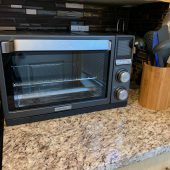 Calphalon’s Countertop Oven is one of the best on the market, from its design, it’s usability, countertop footprint, and more importantly, its price. Currently at $199 on Amazon, it’s an affordable kitchen gadget that can eliminate many others you have lying around, including a standard toaster. 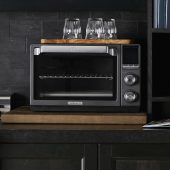 Delivering 40% more heat than the competition including conventional tube heating, the Calphalon Countertop Oven has 11 built-in presets including: Toast, Bagel, Bake, Roast, Broil, Pizza, Cookies, Reheat, Keep Warm, Defrost and Dehydrate. 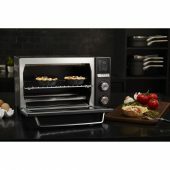 Although I received the Calphalon oven near the end of December, I feel as though this is going to be a GREAT companion for the holidays, when you have the in-laws in town, being able to cook and bake with what’s essentially a secondary oven will save you time, space, and keep everyone who’s in the kitchen a bit more happy. 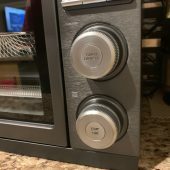 The LCD display of the Calphalon is bright when turned on, coming with three buttons underneath for turning on the internal light, a start button, and a cancel/stop button. 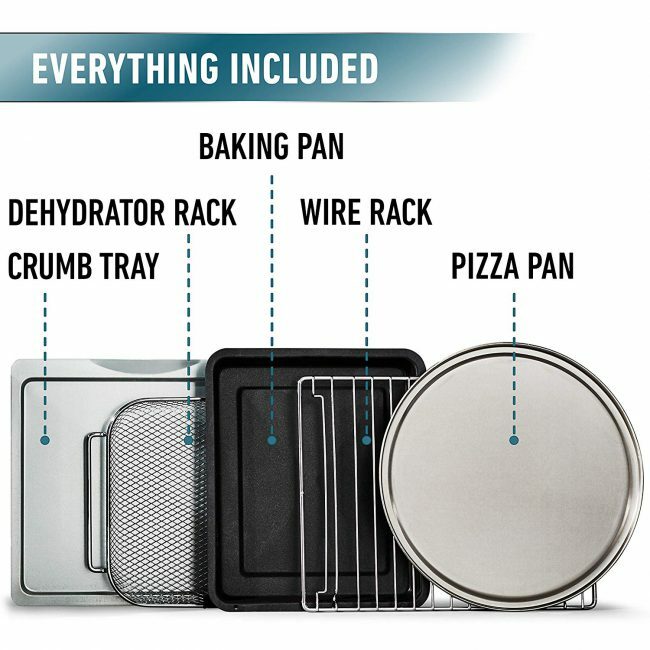 Calphalon’s Oven comes complete with a few accessories including a dehydrator rack, a crumb tray, baking pan, wire rack, and pizza rack. The company states that the Oven can fit a 12″ pizza on the inside, and it’s 12″ exactly. I attempted to fit a Digorno’s pizza which was a bit larger than the 12 inches (due to the crust), and it was a very tight squeeze to get the oven to close. It fit on top of the pizza rack (not completely inside of it), but it did cook with ease. On the inside of the oven, there are top and bottom heating elements that allow you to get an evenly cooked meal, regardless of how low or high you set the tray. Since receiving the Calphalon I’ve baked Italian bread, chicken tenders, pizza, and fries. Calphalon states that you can cook a small chicken inside of the machine but I was a bit wary to test this out just yet, so I still use my full-sized oven for that, for now. What I suggest though, is for foods that have a particular time on their instructions (for examples, french fries in a traditional oven call for being in the oven for 20-22 minutes) I add 3-4 minutes of cooking JUST to make sure that they are evenly cooked. My first try with baking veggies for example called for 15-20 minutes on the “Baked” setting. I instead opted for adding five more minutes allowing the veggies to crisp a bit more and they came out perfect. I do not have a physical kitchen/oven thermometer, but I would certainly suggest investing with one until you’ve figured out the proper temperatures and times for foods as they will vary from a traditional oven. 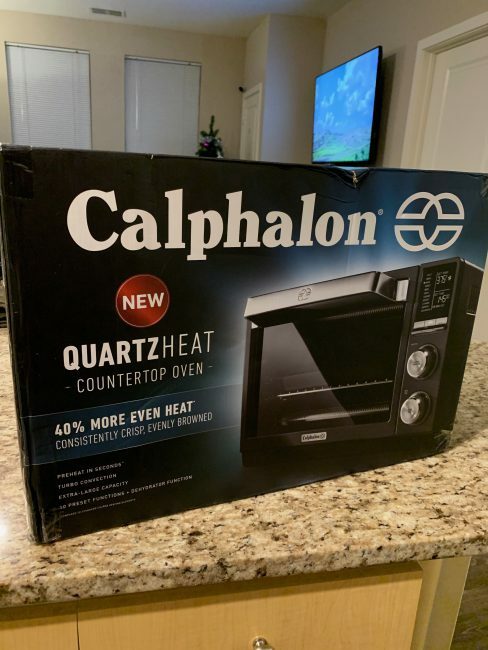 Overall, if you are looking for a countertop oven, and are patient enough to test out the times and temperatures of foods (as they won’t be the same as a standard oven), the Calphalon is a great addition to your kitchen gadgets. 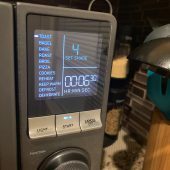 It heats evenly, can toast your bagels, reheat those leftovers, and even dehydrate foods if you’re into that type of thing. The controls are simple and easy to understand, but most importantly it won’t take up much counter space and doesn’t break the bank price wise. 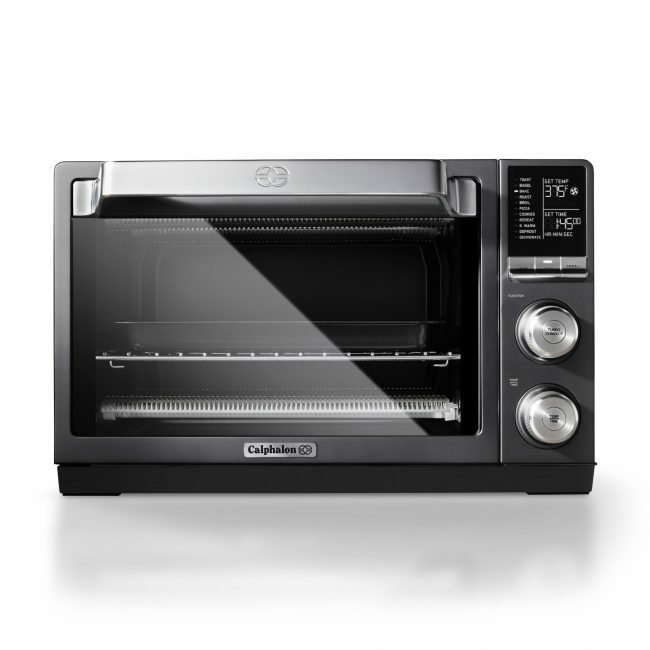 For more information on the Calphalon Quartz Heat Countertop Oven, head over to Calphalon’s site. What I Like: Countertop footprint is small; Setup is simple and easy for children and adults. What Needs Improvement: Cook times may be different from conventional oven times.